Wed Jul 06 15:33:40 2016 All TAP Windows adapters on this system are currently in use. A quick fix will be to disable and enable the Tap windows Adapter from the control panel when you get this issue. To get there follow the steps bellow. 1. Right click the WiFi icon. 4. Find the Tap Windows adapter and right click it. 5. Select Disable, wait a few seconds. 6. Right click it again and select enable. If the issue comes up again, reinstalling the TAP driver might fix it for the long term. Please be sure to check if the TAP driver is already installed by checking C:\Program Files\TAP-Windows and then proceed with the following steps. 3. 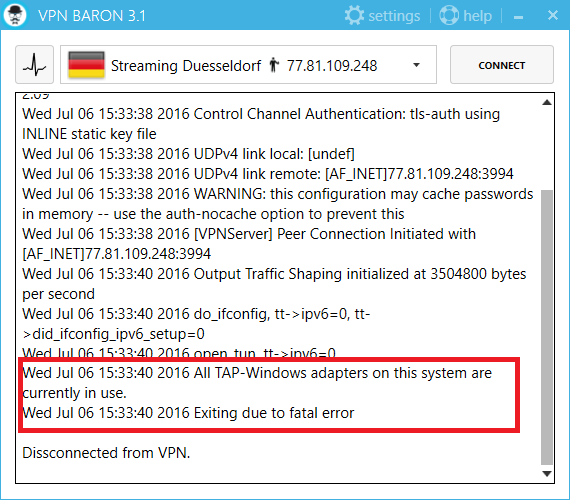 Run VPNBaron as administrator and connect.